Explorers use seismic surveys to produce detailed images of local geology to determine the location and size of possible oil and gas reservoirs. 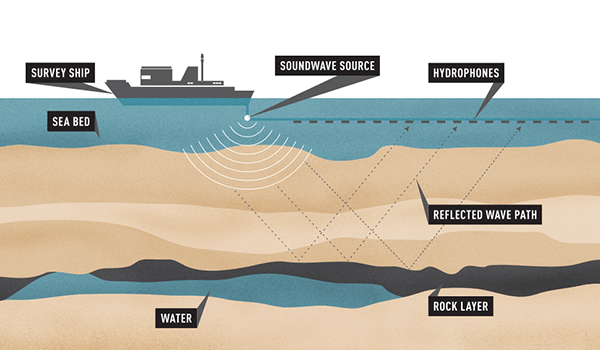 Sound waves are bounced off underground rock formations and the waves that reflect back to the surface are captured by recording sensors for later analysis. Analysing the time the waves take to return provides valuable information about rock types and possible gases or fluids in rock formations. This is similar to the use of ultrasound in medicine. Onshore operations usually use specialised trucks that carry a heavy plate that is vibrated to generate a seismic signal. In offshore operations, a specialised vessel tows a “seismic streamer”, or a collection of cables with seismic sources and hydrophones attached. 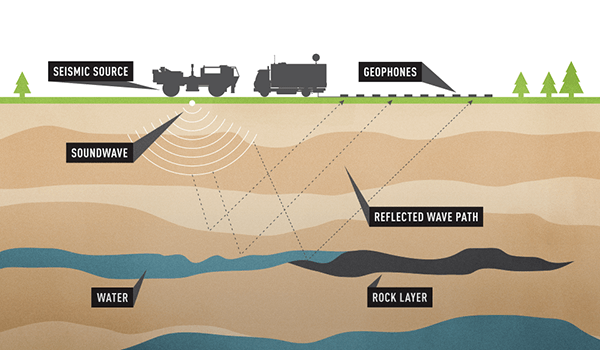 The seismic sources use compressed air to produce acoustic energy. The hydrophones capture the returning sound waves for later analysis. Seismic information is used to accurately plan locations for wells, reducing the need for further exploration and minimising environmental impact. Onshore seismic has been used in sensitive locations without damaging buildings or the environment. Seismic surveys have been conducted sensitive urban environments, such as central Paris. More than four decades of seismic surveying and numerous research projects have shown no evidence that offshore seismic surveys harm marine environments. All Australian whale populations are increasing. For example, humpback whale populations are increasing at close to their biological maximum – more than 10 per cent a year. There is much more offshore oil and gas activity on Australia’s west coast than on its east coast, but the rates of increase are almost identical. A study published in an online journal, Nature: Ecology and Evolution, on 22 June 2017 has challenged the scientific understanding on how sound from seismic surveys can affect plankton. To date, scientific studies have indicated that the sound related to seismic surveys affect plankton communities at a distance of metres to tens of metres. But research by Associate Professor Robert McCauley from Curtin University’s Centre for Marine Science and Technology challenges this belief. According to this research, marine seismic surveys can affect plankton at significantly larger distances from the commercial seismic array than previously believed. The oil and gas industry has significant concerns with this research, including overall replication, sample size, conclusions inconsistent with the data and the lack of a biologically plausible mechanism for the observed plankton mortality and changes in abundance. However, consistent with its commitment to the highest standards of environmental protection, the industry has moved to further research the effects of seismic sound on plankton. APPEA commissioned the CSIRO to model the potential local and regional impacts of a typical marine seismic survey in the North West based on the McCauley et al results. The modelled seismic survey ran for 36 days (late December 2016 to early February 2017) and covered an 80km x 36km area. It took a precautionary approach by assuming that McCauley’s main findings were accurate, and used McCauley’s plankton mortality estimates and spatial ranges. More research is being planned to assess potential impacts of seismic survey sound on plankton communities. Oil and gas operators and marine research organisations are discussing the exact timing of this research. This research is part of a three-year study through the Australian Institute of Marine Science that will seek to enhance understanding of how seismic sound affects the marine environment. Seismic processing requires powerful computers, sophisticated software and specialised skills. Once the seismic has been processed, it must be interpreted. Interpretation requires highly trained scientists (geophysicists). Usually seismic results will be compared with other data (such as rock samples, regional well results and known geology) to enhance the accuracy of the interpretation.